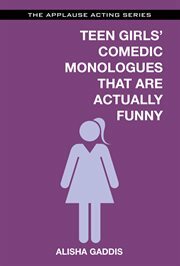 The item Teens girls' comedic monologues that are actually funny, Alisha Gaddis, (ebook) represents a specific, individual, material embodiment of a distinct intellectual or artistic creation found in Charlotte Mecklenburg Library. This cutting-edge, incredibly hysterical monologue book is specifically for teen girls who need the extra bang to land the perfect comedic role. Teen Girls' Comedic Monologues That Are Actually Funny features monologues by writers and comics who have written and/or performed for Comedy Central, Backstage magazine, NBC, Huffington Post , The Onion , Second City, E!, and many more. This book is the answer to the comedic monologue needs of teen girls everywhere!